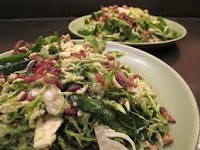 Try this amazing spinach salad recipe...the SPINACH 'N' SPROUT SALAD ....nice one ! Wash and trim spinach. Dry. Chill. Soak sprouts in ice water in refrigerator for several hours. Arrange spinach in salad bowl; top with well-drained sprouts, then with water chestnuts. Blend ingredients for dressing thoroughly. Pour over salad. Toss gently. The spinach salad recipe is ready to serve...enjoy it !